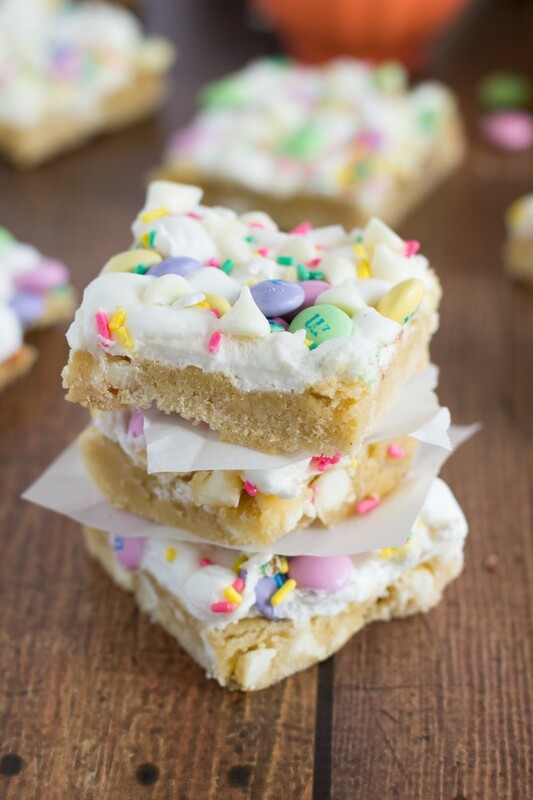 Confetti bars made with Spring colored M&M’s, white chocolate, Spring sprinkles, and gooey marshmallows. These easy dessert bars are sure to please a crowd! Aren’t these Spring confetti bars so fun?! And perfect for Spring and Easter-time? Growing up my mom often made these confetti bars for my siblings and me. They were definitely one of the favorite desserts (along with these carmelitas). She would use a chocolate chip cookie base, loads of marshmallows, colorful sprinkles, miniature chocolate chips, and chocolate covered pretzels. They are the best dessert bars! We’d always get excited when my mom would buy miniature chocolate chips or when chocolate covered pretzels would go on sell. Because that meant lots of confetti bars! My mom would hide the miniature chocolate chips and wouldn’t let us to eat them because they were ONLY for confetti bars. Which was fine by us; as long as she kept good on her word to make them! These confetti bars are similar, but a little bit different. The base is a white chocolate chip cookie dough that is baked for about 17-22 minutes. Then marshmallows, white chocolate chips, and M&M’s are thrown on top and these bars get baked for another 2-3 minutes. Everything gets all sorts of gooey and delicious. And then comes the time for sprinkles! I used white chocolate to make these a lighter and more Spring-like dessert. You can definitely change out the white chocolate for milk, dark, or semi-sweet chocolate. Just make sure to change the chocolate chips in the base and for what is sprinkled on top. 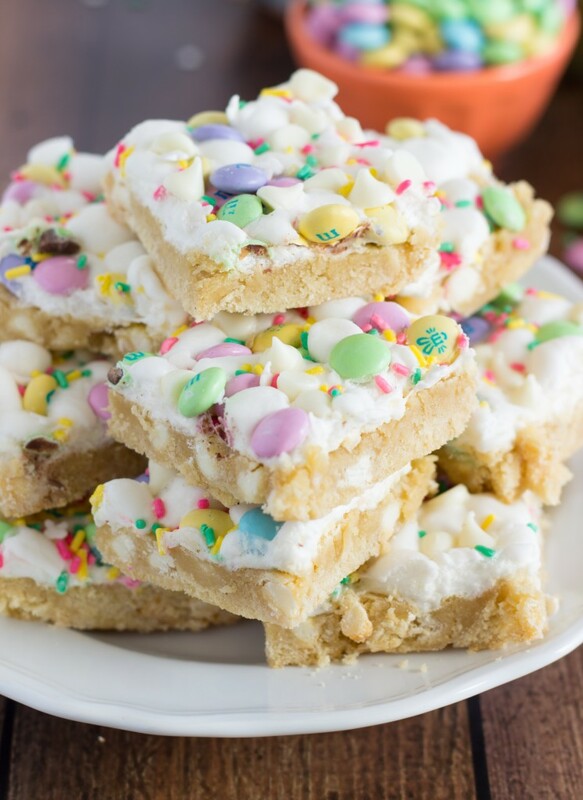 Confetti bars made with Spring colored M&M's, white chocolate, Spring sprinkles, and gooey marshmallows. These easy dessert bars are sure to please a crowd! Combine the room temperature butter with the white and brown sugar in a medium sized bowl. Mix the butter and sugars together with hand beaters or in a stand mixer until creamy and fluffy. Mix in the egg and vanilla and beat until just incorporated. In a separate bowl, combine the flour, baking soda, baking powder, cornstarch, and salt. Stir together and slowly add the dry ingredients to the wet ingredients. With a wooden spoon, stir in one cup of the white chocolate chips. Press the cookie dough into a 9 x 13 pan that has been sprayed with nonstick spray. Bake the cookie dough for 17-22 minutes or until the edges are lightly browned. Remove and immediately top with the miniature marshmallows and M&M's. Return to the oven for 1-2 minutes or until the marshmallows become puffy. Remove and sprinkle the remaining 1/4 cup white chocolate chips and sprinkles over the bars. Let cool completely and then cut with a wet knife. These are basically what i want my spring to look like! Love all the pastels and going with white chocolate was definitely spring-perfect! Oh my gosh…these are ridiculously cute! AND SO DELICIOUS. Marshmallows, chocolate, M & Ms and sprinkles are my life so these must happen. Pinned! These are the cutest bars ever – I love the tiny bunny sprinkles!! Also, topping these with mini marshmallows is such a genius idea. I bet it makes them extra ooey gooey :). How could I not pin this one?? Hope you have the most amazing weekend ahead, dear! So fun Chelsea! There’s only one problem. I may not get any because the kids would be all over these. These are Spring perfection! So excited to see those soft pastel colors in recipes. You sure have a talent for coming up with yummy treats, Chelsea! 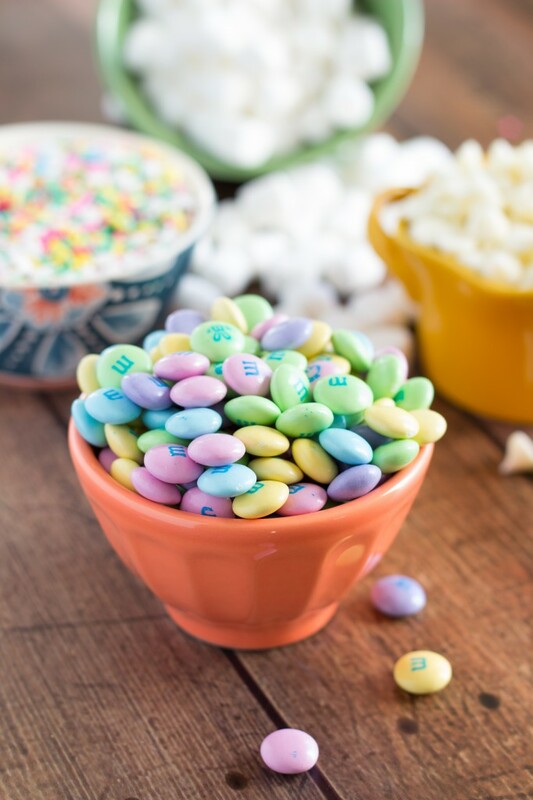 Spring colored M&Ms bring the perfect touch. It’s nice that this recipe reminds you of a favorite treat growing up 😉 Have a wonderful Friday! Thanks for sharing! These look amazing, I’m loving all the pretty colors! Oh my gosh, I’m obsessed with these bars!!! They’ve totally got me in the mood for spring AND now I’m craving to eat these. 🙂 They will be a perfect treat for the Easter dessert table! These are so perfect for spring / easter! 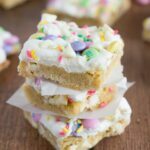 I’ve never made confetti bars before, but I really want to try them now. So festive and delicious! Oh wow these have to be the most adorable bars I’ve ever seen! Those bunny sprinkles – I’m dying from a cuteness overload – I NEED THEM IN MY LIFE. Ahhh and the bars sound so delicious too! these definitely get me in the mood for spring! Oh marshmallows and a sugar cookie base?! My weakness! Hi there, thanks for such a great recipe.. I am going to make these for my girls’ spring party. Thanks again !! These are so cute and looks so YUMMY! Hi Chelsea! These bars are so pretty — they would be the perfect dessert on a kids’ Easter table! Thanks so much for sharing — I’ve pinned them! I love bars and these look fantastic! Thanks for sharing this great recipe at the In and Out of the Kitchen Link Party! Always glad to see your great recipes! Oh my gosh do these ever look good! You had me at white chocolate and gooey marshmallows. Thanks for sharing at Simple Supper Tuesday. These bars are fabulous! Thanks for linking up with What’s Cookin’ Wednesday! Wow! They are beautiful. Thanks for sharing. hey guys one quick question are these good>. did you use salted or unsalted butter? Thanks. Can’t wait to make these! You can use either one. If you use salted just omit the added salt. can you refrigerate these immediately after baking? These are so adorable and look sooo yummy! Do you think these would be okay on Easter if I made them today (Friday)? I believe they are the best the day of because of the marshmallows. The day after is okay but I wouldn’t stretch them too much longer than that. These are so cute! I’m making them as an Easter treat for the kids. I make white chocolate chip bars all the time- the confetti addition will be fun! With the marshmallows on top, are they best made and served on the same day or are they fine to to make a day ahead? Thanks. I like them best the day of! So adorable! Love all the pastels! How well do these keep? Do they stick together due to the marshmallow? Can they be individually wrapped or will they stick to the plastic? Sorry for so many questions. I’m a bus driver and like to make my kiddos holiday treats. You sound like the best bus driver ever! They unfortunately don’t keep too well, kind of past there prime even by the end of the second day unfortunately 🙁 They do wrap pretty well though and don’t stick too bad to plastic because of the M&M’s and sprinkles on top kind of push down the marshmallows. These are so cute! Is the cookie bar supposed to be doughy or more of a crisp cookie? So fun for kids to help decorate! We prefer it more doughy, but bake longer for a more well done cookie. They shouldn’t be crisp 🙂 Yes so fun for kids to get involved!! They are delicious!! Super easy and fun! Love the colors and they are just so yummy! So happy this was a hit! 🙂 Thanks for the comment! These look amazing and perfect for Easter!! Would be so easy to make the dough the night before and pop in the oven the next day! Does anyone know if the dough sits well overnight? The dough sits great overnight! Cover it tightly and you’ll be good to go 🙂 Enjoy! I couldn’t get the dough to stretch into a 9×13 pan :/ just wasnt enough to stretch it without there being gaps. it didnt look like the video lol. used an 8×8, hope its okay. I hope you were able to get it to work out ok in the 8 x 8 pan 🙂 It does stretch very thin in the 9 x 13 pan!